Cluster Manager of FEMAC, Mr. Enric Pedrós, was invited ta take part of the panel “Cluster capability building tools and approaches to innovation, internationalisation, sustainability and cluster management competencies ” , in the meeting of CLUSTERS3 Conference : Powering innovation & building capacity. The Conference programme was designed to tackle as many of the issues raised to date during CLUSTERS3 two year learning journey and hence the speakers have all been sought to reflect on some aspect pertaining to cluster capacity/capability building from a Government perspective, Industry Perspective, Cluster Manager Perspective, Academic Perspective. To find out more about clusters and how they can drive individual company growth, join us at our conference where international speakers from Norway, Canada, Denmark and Spain will share their success stories. 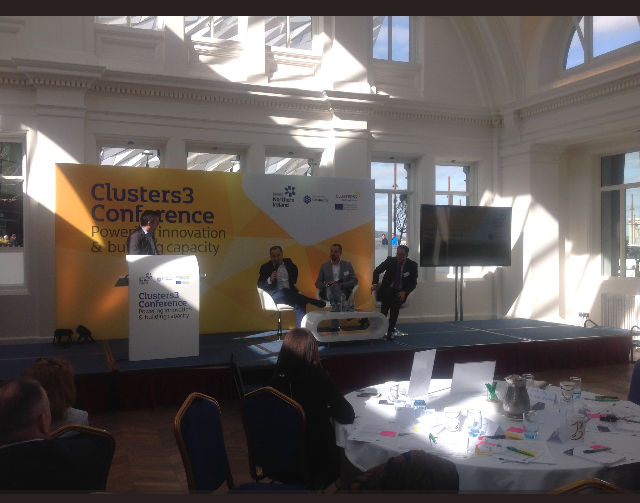 The conference was hosted jointly by Invest NI and the Department of the Economy, both of which are partners in the Interreg-funded CLUSTERS3 project.